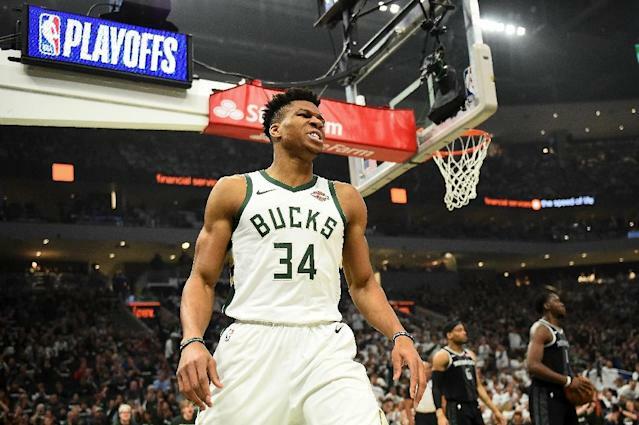 Los Angeles (AFP) - Milwaukee showed why they are the Eastern Conference kingpins and Giannis Antetokounmpo proved he is worthy of a league MVP as the Bucks trampled all over the Detroit Pistons on Sunday. "It was fun," said Greece's Antetokounmpo. "We did a good job of playing hard and playing together. "The coach told us at halftime to stay together, keep rebounding the ball and run it down. "I am just glad we got a win." Detroit tried everything to stop the 'Greek Freak' and the only time they did was when centre Andre Drummond shoved him to the floor with both hands which got Drummond thrown out of the game by the referees. Drummond threw a kiss to the Fiserv Forum crowd as he headed to the showers but it might as well be the kiss of death for the Pistons against the NBA's top team (60 wins) in the regular season. On Sunday however Portland's three-year wait for a postseason win came to an end, as Damian Lillard inspired a battling victory over the sixth-seeded Thunder. Lillard said Kanter's fired-up contribution had tipped the balance for the Blazers. "Any time you're going up against a team you played for, in the most important series of the year, you're going to want to play well," Lillard said. "And you're going to want to come out on the winning side. "We understood that he was going to come out ready to play. And he was the MVP of the game, especially down the stretch. "He had a huge presence and played a big part in us winning this game."